Welcome to Italy. We arrived in Catania on Monday August 2, 2010. We were at sea all day Sunday. I had a very restful day enjoying afternoon tea and playing bingo. I just love to play bingo when I'm cruising. I even win sometimes. Catania, Italy is on the island of Sicily. Sicily is separated from Italy by the sea and centuries of history. On the island are Greek temples, Roman mosaics and Norman cathedrals. Are you ready to see Sicily? I would love to be your guide. 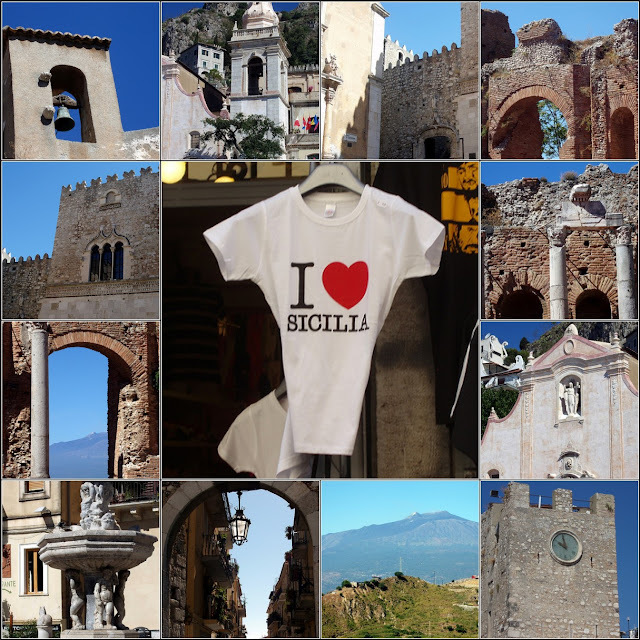 We began our tour with a pleasant drive to the city that is the essence of Sicily - Taormina - built in the 3rd century by the Greeks, and later completely renovated by the Romans. Perched on a terrace overlooking the sea, its medieval character was a delightful sight. We walked to the Piazza VittorioEmanuele and the bustling main street of Corso Umberto, which was lined with former mansions with enchanting architecture and balconies that were bimming with flowers. We stopped briefly at the inner courtyard of the medieval Corvaja Palace for a look at a richly painted original Sicilian carretta or carriage. We followed our guide up to the narrow street that leads to Taormina's impressive Greco-Roman theatre, which dates back to the 2nd and 3rd centuries BC, and still hosts performances today. The theatre's dramatic location is nothing less than breathtaking, with an incredible view of the Bay of Naxos and Mt. Etna in the distance. At the 15th century Palazzo Corvaja we saw an excellent example of the characteristic black and white lava and pumice-work of Taormina architecture. We strolled Corso Umberto, the main street of Taormina, bounded by the Porta Catania, Porta del Centro, Clock Tower and the Porta Messina. The Piazza IX April terrace gave me a superb photo opportunity with its fine panoramic view over the Gulf of Taormina. It was a fabulous morning. The weather was perfect for photos and the sights were outstanding. After our tour we drove back to the ship to spend a lovely afternoon in the beautiful Italian sun. Our tour is over for today but, we will see beautiful sights as we explore the wonders of mainland Italy in the upcoming posts at My Cozy Corner. I hope you have enjoyed your visit. I have enjoyed sharing the beautiful island of Sicily with you. Please link back and visit more Outdoors and everything White. Great mosaic. I've never been on a cruise and never been to Italy. Looks like a great place to visit. I have several friends who love cruising and go several times a year. Lovely post with great shots. Bella Italy! Looks like you are having a great time! Happy WW! Thanks for the tour since I'll probably never get to go there! You were the perfect tour guide...thanks for letting me tag along! Great mosiac too!